'Take time to play with your kids,’ the ad campaign encourages. A recently acquired 1963 Ford Sunliner Convertible model would be the object of their shared fascination today. But before such an old toy can be handled, proper safety precautions must be taken. 6% lead content is no laughing matter and a responsible parent does not risk exposure. A small mask and latex gloves ensure safe play for parent and child alike. The challenge to create a futurology for this object and return it to the state of a toy, freed from its transparent tomb, requires consideration of its history, composition and function. Above all, it requires a child play with it. In order to do so, I could not ignore the risks associated with the lead content in the red paint. Ingestion of such a substance can occur through direct contact with the mouth (as demonstrated by the car’s previous owner)but also indirectly through the mouth via the hands. 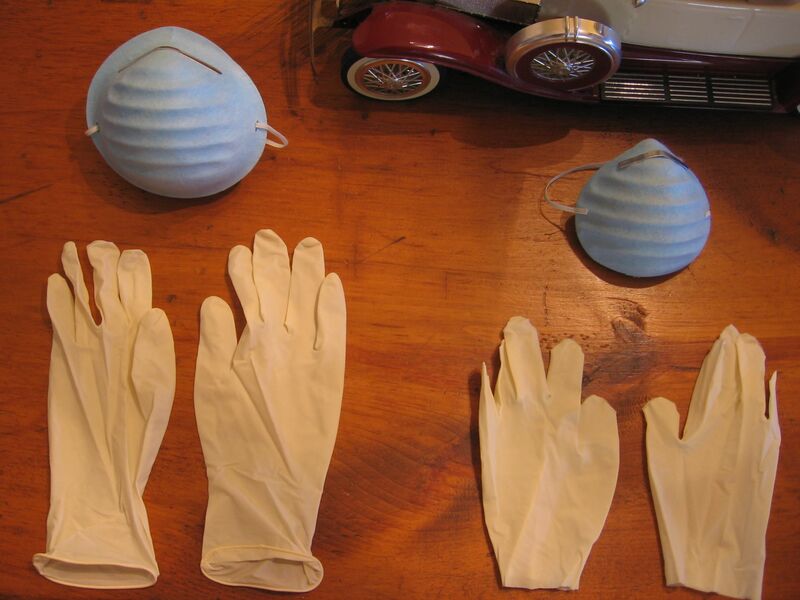 I have imagined the conditions under which a child would be allowed to play with the car: a simple mask and set of latex gloves worn by both child and supervising parent during play significantly lowers the health risks. Roland Barthes suggests that “Toys here reveal the list of all the things the adult does not find unusual: war, bureaucracy, ugliness, Martians etc.”. I continue his list by adding extreme fear of illness and excessive measures to ensure the health and safety of our children. By wearing a mask and gloves to play with the Sunliner, it is not only the toy that “prefigures the world of adult functions” but also the act of wearing the mask and gloves.